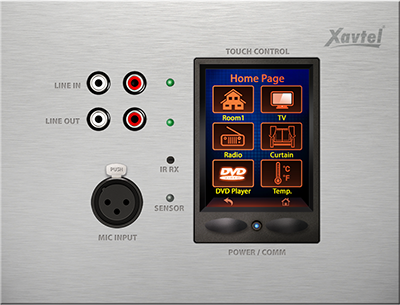 The RWD-AIO is a flush-mount remote controller which comes with a 2.2" TFT touch screen, a RCA stereo input/output connector and a XLR connector for mic input on the front panel. The RWD-AIO is powered via STP CAT5/6 cable with up to 820ft/250m through OCTO-Link. If the control signal of RWD-AIO is not strong enough, the RWD-AIO can connect to DLR01 Digital Loop Repeater. And if the power of RWD-AIO units is not enough, the RWD-AIO can connect to a 24VDC local power supply. The RWD-AIO is designed as easy to use remote controller, the touch panel allows for various function controls such as logic control, volume control, message play, dynamic GUI status display, custom image button, logo, background etc., and this can be easily programmed by OCTO Jr Designer software. The 4 CH input and 4 CH output OCTO-Link card on OCTO Jr (E-slot only) allows the RWD remote devices to be connected for the benefits with different kinds of applications. One RWD-AIO can also be connected to OL-AMP (Low-Z digital amplifier) at the end of the bus via OCTO-Link. In addition, the RWD-AIO also comes with a IR receiver built-in for user to control the unit without standing in front of the machines. All of these devices can be integrated into our life and create a truly smart homes/offices.